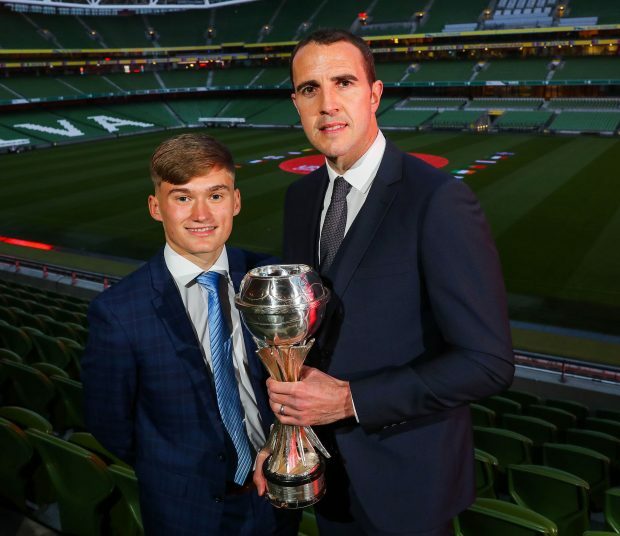 Republic of Ireland Under-17 Captain Seamus Keogh with European Under-17 Championship Ambassador John O’Shea at the draw in the Aviva this week. Photo: Inpho. The four games that will be played at the Waterford Regional Sports Centre during the UEFA Euro Under 17 Championship finals have been confirmed with the Republic of Ireland’s second group game against Czech Republic set to be played at the South-East venue on Monday, May 6 with a 7pm kick-off. Colin O’Brien’s side were put in group A as hosts of the competition and the Irish squad that looks set to include Waterford native Timi Sobowale will take on Belgium, Greece and Czech Republic after John O’Shea completed the draw at the Aviva Stadium last week. The tournament, which will be held in Ireland from May 3-19, sees 15 teams join the host nation in competing for the trophy that was last lifted by Netherlands in England in 2018 with the 2019 final set to be played at Shamrock Rovers’ Tallaght Stadium on Sunday, May 19. With the other two of Ireland’s group games to be played at Tallaght Stadium, the RSC will also host the group B clash between champions Netherlands and Sweden on the opening day of the tournament on Friday, May 3, with a 2pm kick-off, with France and England also included in that group. Group C will see Iceland, Portugal, Hungary and Russia, with the meeting of Hungary and Russia set to be played at the RSC on Friday, May 10, with a 2pm kick-off while the final group will see Germany, Spain, Italy and Austria with the clash between Italy and Austria fixed for the RSC on May 7 with a 7pm kick-off. Commenting on the draw, Republic of Ireland Under 17 manager Colin O’Brien said, “Irish supporters will always get behind their team and that’s what we’ll be looking for them to do but people have got to beat in mind that this is going to be the players’ first competitive games. “It’s going to be their first competitive games for Ireland and it just happens that these games will be in Ireland. It happens to be the European finals as well so it’s a big deal for the players. We will be prepared and it’s a great chance for players to propel themselves. “It’s the biggest thing for the players right now. It’s the best of the best coming to Ireland, it really is. There’ll be really high quality players and real high tempo matches so they’ll have a great opportunity to test themselves against the best.” Ticket prices start at €5 for adults and Under-16s go FREE with tickets available from the FAI website. Friday, May 10 – Group C – Russia v Hungary 2pm.